If you can't find the help you need, please do not hesiate to contact us at 020 7582 6543 or help@reachvolunteering.org.uk. If you’ve forgotten your password or just want to change it, you can use the forgotten password form to reset it. If you are not logged in, you will need to enter your registered email address. Click the reset password button and we will email you a link to a secure page. If you open this page, you will be asked to enter and confirm your new password. Don’t know your registered email address or no longer have access? Just give us a call and we’ll be happy to help. If you are logged in, you can change your user name, password, and email preferences in your basic account settings. 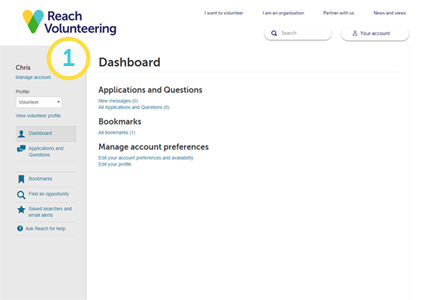 If you have a volunteer or organisation profile, you can edit these from Manage account as well. Go to Basic account details (2) to change your user name, email address or password. 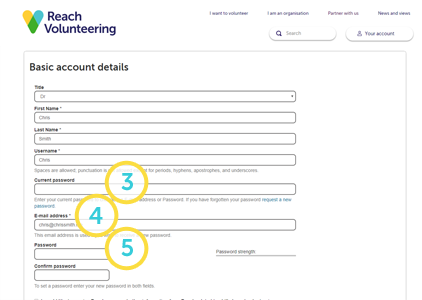 You will need to re-enter your current password (3) if you want to change either your email address (4) or password (5). Hit the Save button to save any changes. If you have a volunteer or organisation profile, it will be listed (6) under Manage account. Volunteers can set their availability. If you update your profile to Not available you will no longer appear in search results and other users won’t be able to see your profile. All of our users agree to receive certain service emails as a condition of using the service. These include notifications of messages received through the system, reminders about your profile and opportunities and very occasional service updates. You can sign up or unsubscribe from our newsletter (7). Volunteers can also receive email suggestions for opportunities that may be of interest to them. If you’d prefer not to receive them, you can subscribe (7). You can also view any saved searches and email alerts from that page on your dashboard (8). We'll be sad to see you go, but if you'd like to delete your account, it's not a problem. 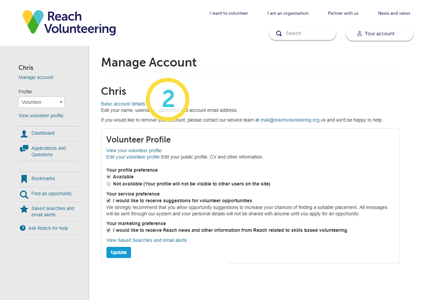 Just email us at help@reachvolunteering.org.uk and we'll take it from there. Please let us know if you have any feedback so we can continue to improve our service for our other users. How to post an opportunity, for new and existing organisations, and how to close them down when they are no longer available.